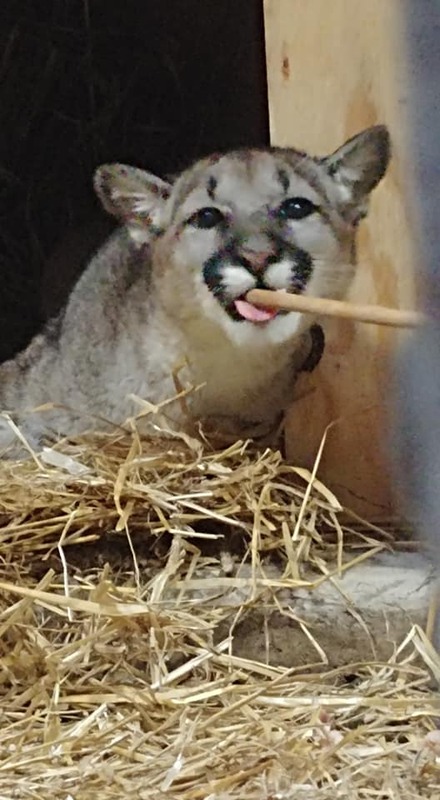 Beausoleil, “Beau” for short, is now our youngest cougar. He was rescued at about 6 months of age from Washington state. He is wild-born and is still getting used to living around humans. He is slowly warming up to his caretakers, but we are excited to see little bits of his personality starting to shine! 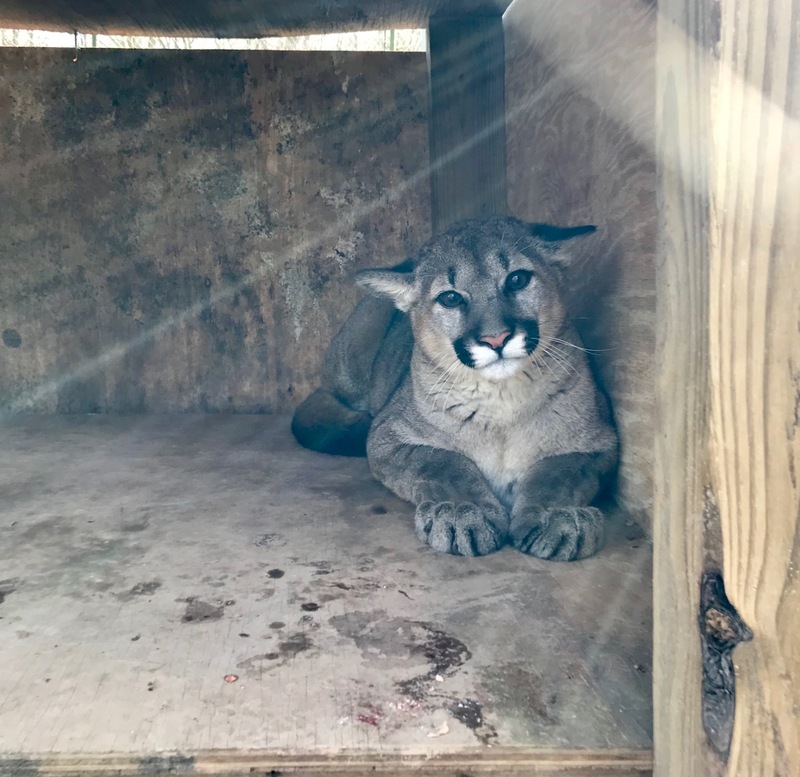 Beausoleil, or "Beau", came to Carolina Tiger Rescue in January of 2019. Beau was wild-born in the state of Washington. 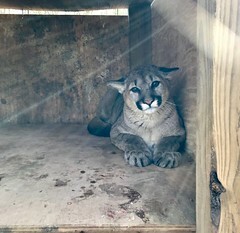 He was seen in a family's backyard a few times without his mother and when Wildlife Services came out, they trapped him and decided to relocate him to a sanctuary. In the state of Washington, any apex predator that is captured has to be relocated outside of the state within 24 hours or they are euthanized. 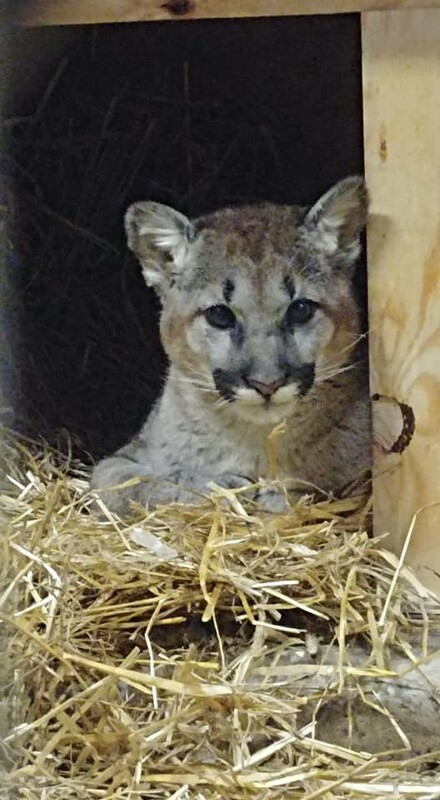 Carolina Tiger Rescue was contacted by one of our sister sanctuaries, Wildcat Rescue in Minnesota, who has worked with the state of Washington before to re-home orphaned cougars. We coordinated with them to get Beau flown to Minnesota where he was picked up by a Wildcat Rescue volunteer and driven to Indianapolis. There, they met members of our team to bring Beau the rest of the way to his new home. Beau is very hesitant about his new surroundings. He watches inquisitively and safely from his den box as the keepers clean his enclosure. He grumbles a lot and hisses if anyone gets too close to remind them that he is wild and does not want to be approached. As he has spent more time around humans, he has become a little less nervous. Beau loves enrichment and one of his favorite things to do is tear boxes into the smallest pieces possible! Beau is dark grey with a white belly. Because he is still a cub, he still has his spots along his belly. He has enormous feet which he has not yet grown into. Beau is currently in the process of loosing his baby teeth and his adult teeth are making their way in. We have not heard him purr yet, but it will still take some time for him to settle into his new home. Beau currently lives in Elm Grove off the tour path. He recently moved outside after a longer-than-normal stay in quarantine to help him get used to humans in a controlled environment. Being wild-born, he has never been around humans before and still needs time to acclimate to his new surroundings but he is enjoying his outdoor enclosure. It is unclear as to how Beau became orphaned. However, one problem many wild animals face and one that is becoming more common is loss of habitat due to human encroachment. As we humans continue to expand our territory, it is important to remember we need to preserve land for the wild animals and make corridors and pathways for their territory to remain accessible so they can remain wild.